They have all kinds, all shapes…Because of glare – the glare of the sun is pretty bad and mostly, even at white-out, these are very handy… When spring comes, the sun is very bright. 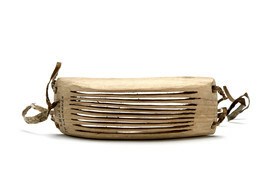 This pair of St. Lawrence Island Yupik goggles has multiple slits like Venetian blinds, providing a broad field of view. Goggles protected the eyes from wind as well as light reflecting off snow, ice, and water. Goggles carved from walrus ivory have been found in Old Bering Sea archaeological sites nearly 2000 years old. Jacob Ahwinona: My grandfather had several of those but not as fancy. He used to wear them when I was a boy. He made them out of wood, the soft wood. They form it to their own head. They had those small slits like that. Whenever you go out hunting or when the sun is shining, you’d take those along. Especially the long daylight hours in the spring they wear those. They won’t get snow blind out there. Aron Crowell: How about on St. Lawrence Island? Estelle Oozevaseuk: They have all kinds, all shapes. And some of them have that visor-like thing [eye shade], very narrow up here up above the [eye-slits] because of the glare of the sun is pretty bad, and mostly, even at white-out, these are very handy. That’s what they say. It’s the same thing when they’re hunting. When spring comes, the sun is very bright. They take them, that kind of goggles. Branson Tungiyan: Unaghsimeng taakutlu pikaagut. Estelle Oozevaseuk: Some of them are made of wood. Some are beautiful ivory. I think the collection here has some here too. I saw them when Dr. Collins was collecting. And when they have nothing like this, they even use a stiff kind of skin, just make a slit like that and put a string around it. I think just because in springtime, sore eyes are pretty bad, [which they can get when] they’ve been out all the time walking, hunting, around. I think this is even good for wind. Suzi Jones: Out in a boat on the water, did they used these as well? 1. The Elders did not look at this snow goggles, but discussed another pair E044256, from which these comments are taken.